As for the rest of this visit to Turkey? Well, Ireland are very much in the same place as they have been for the last few years, struggling to score goals, even create goal chances and work opposing defenders. Martin O'Neill today won't be shedding many tears over this 1-0 loss to Turkey in Antalya, a very tidy stadium which deserves to host games on the big stage, should Turkey succeed in their bid to host the Euro 2024 finals. There was trouble on and off the field, some nasty stuff indeed, for the Irish visitors on their trips here, in 1991 and 1999, but Turkey was a perfect host for the Irish team and the 260 hardy fans who made the trip to see this defeat. 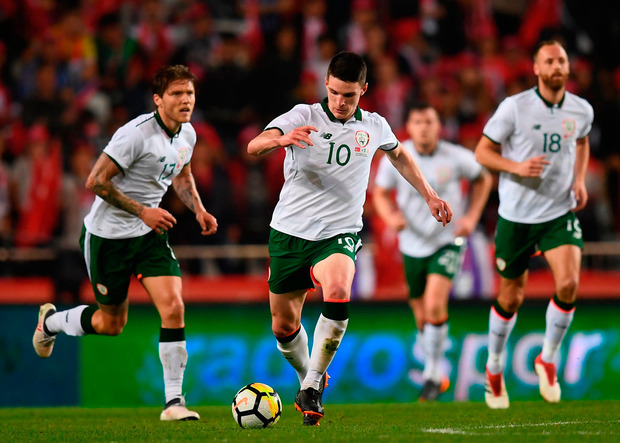 Ireland returned the favour by being very meek house guests, and while a 1-0 friendly loss in March, months ahead of the next game of consequence is nothing to be ashamed of, the fact that Ireland didn't have an attempt on target, or a moment to worry the opposition bar a shot from debutant Scott Hogan. Rice's display in a three-man defence, where he looked far more mature than his 19 years, is a good sign. Whether that's enough to persuade O'Neill to stick with the three-man defence is another matter. For his part, Rice says he was pleased to bed in at this level, no surprise from him at the lack of first-night nerves. "I think there is something in me. I'm composed and I'm a calm player," Rice said in Anytalya last night after his senior debut, no rest for the teenager as he's bound for Dublin to prepare for Tuesday's U21 Euro qualifier at home to Azerbaijan. "You're only out there for 90 minutes and you have to give it everything you've got. It's a game of football at the end of the day. I am only 19, but I've had good experiences with West Ham this year and I've tried to take that onto international level last night. "I thought I did well for only being 19 years old on the international scene, I was proud of myself and thought I performed well. "The goal was frustrating because all week, we've been banging on about the set pieces and to concede one last night is not what we wanted as we threw our bodies on the line and to concede from a set piece puts a bit of a downer on the night," added Rice. 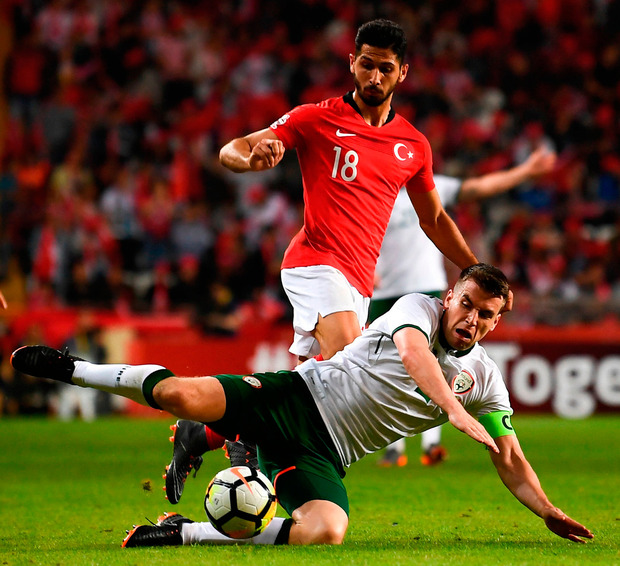 Looking back on the game, O'Neill will feel this was not the worst night, Turkey only winning the game with a goal from a poorly-defender corner kick. That stuff is preventable, can be reviewed on tape and worked on. It's what Trapattoni used to call 'the leetle details' but once again Ireland have been caught out at a set piece, from a short corner. "It's the little things, you get punished at this level if you don't do it right," said Shane Duffy. "We are at the highest level and even the little details - which I learned when I started - and the errors that happen, you just cannot make them. "You do get punished . It was an even game last night and the little error cost us." But the lack of a creative spark, the absence of chances from midfield, the non-existent service to the strikers... that's still a job of work for the Ireland manager and Irish football. The issues are not limited to the sphere of the national team: Shane Long, a second-half sub last night, has scored one goal in 30 games for club and country this season while Scott Hogan had a flurry of goals for Aston Villa in January/February but not much before or after that run. Hogan and Seán Maguire are new to this level, Hogan making his international debut last night while Maguire made his first start, and maybe theirs is a partnership which could bear fruit. But they need to the ball before they can put it in the back of the net and they had no service last night. Well, Hogan did, briefly. Early in the first half Jeff Hendrick played in a superb pass which split the Turkish defence and set up Hogan but maybe a mixture of nerves and lack of senior international experience combined to force Hogan off course and he fired into the side netting. So while the Turkish keeper had a quiet night, not needed to make a save of note, Colin Doyle was busy but never over-stretched, certainly nowhere near as busy as Dean Kiely was when Ireland drew 0-0 in Turkey in '99 but went out of Euro 2000 on goal difference. Doyle was still beaten, though, early in the second half. A short corner from Hakan Calhanoglu (the best player on the park) played to Yusuz Yazici, and his cross was finished by captain Topal. Turkey have not had much to cheer about of late, missing out on the World Cup finals, and in truth they will not want to spend much time looking back on the DVD of this game. Some of their finishing was awful, a series of shots on Colin Doyle's goal in the first half which were more akin to a GAA player trying to take his point, confident that the goals will come. There was an edge to the game, though, with two Irish players booked, Alan Browne and David Meyler. The Irish side which finished the game had more experience than the starting XI, veterans like Shane Long, Ciarán Clark and David Meyler thrown on to add some steel to the side, though it was heartening to see Alan Judge come off the bench and win only his second cap, two years after his debut. Judge can add something to midfield but the fact remains that goals are hard to find, not usual for Shane Duffy to be one of the leading scorers in a campaign. "You don't want your centre halves getting all the goals," Duffy admitted. "I thought that the two lads in attack did well. They worked hard although I felt that we were a little bit too far away from them. "Seánie has been out for four months and Scotty has not been playing regular football. I felt that they were great for us off the ball. "Scotty got his chance and maybe when he is playing regularly he will put them away. "The manager is working on things and trying to get us to score more goals." Hogan and Maguire are still learning at this level, and with a bit more service they could prosper, but finding someone to provide that service is the question that will nag O'Neill and his staff in the months ahead.